What is it with LA Thai restaurants? Why is it that seemingly every strip-mall hole-in-the-wall Thai restaurant serves spectacular cuisine, while many Thai restaurants in the Bay Area struggle to rise above mediocrity? Whatever it is in the southern California area that inspires Thai cooks, it’s alive and kicking at Jasmine Thai Cuisine. We went there for dinner last Saturday night (June 2014), and had a simply delicious meal. Jasmine Thai is a 2-restaurant chain in the west San Fernando Valley. We visited the Winnetka branch because it got better slightly better Yelp reviews. The restaurant is cute and well decorated, but it can’t quite escape its strip-mall architecture. Fortunately, the prices match the casual surroundings with most entrees priced at a downright cheap (at least by Bay Area standards) $8. 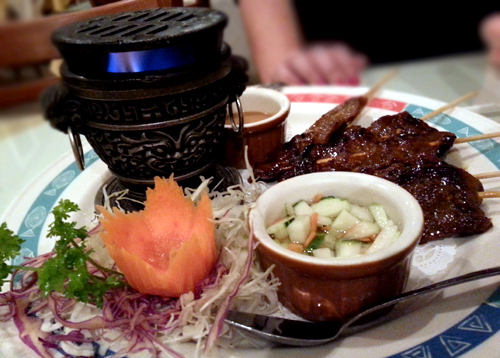 We started by sharing an order of beef satay ($8). The order came with six sticks, which was great as there were three of us. The beef was very nicely marinated, and had a very strong flavor. The peanut sauce was standard, which is nothing to complain about. The dish was beautifully presented in a plate that came with a small iron heater of some kind with a pretty significant flame. I’m not sure if it was there just for decoration, but we did enjoy putting our meat in the flame. I hadn’t seen this before, and enjoyed it. I know my girls would have loved it. We followed this with the cashew nut chicken ($8), panang curry with beef ($8) and curry duck ($11). 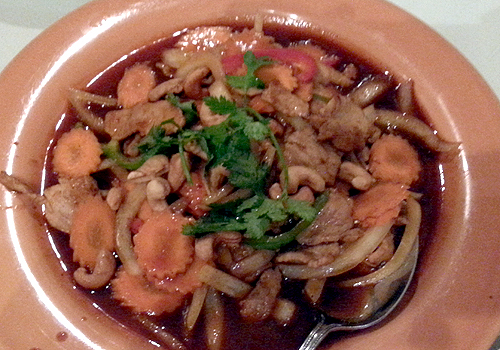 The cashew nut chicken was fine, though perhaps not as interesting as one might have liked. Kathy did like the sauce quite a bit, though. The two curries, however, were outstanding. 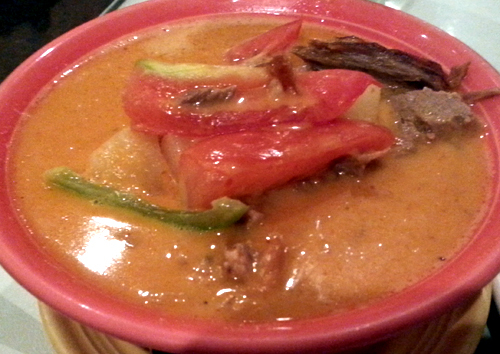 the panang was perfect, flavorful, deep, complex, and yet very much a panang curry. The sliced beef had probably been sauteed separately and then added to it, so it wasn’t the star of the dish, but it was good enough. It was the sauce, however, what really shined. The duck curry was similar, albeit a bit fruitier and sweeter, probably from the pineapple chunks it came with. It was also delicious. The duck, a hard meat to get right, was well cooked, not too fatty (but it’s duck), and went very well with the sauce. Both curries are noted in the menu as being spicy. We asked for them as mild as possible, and our tongues still burned a little bit. The portions were all quite generous. We had leftover of both curries to bring home (which my husband got to enjoy fully). Where they did skimp was in the rice ($1.50 per person). We probably could have used more at the table and had none to take home. Next time, I’ll order an extra portion. Both my dad and I had strawberry smoothies ($3.25) with our dinner, and they were OK. They basically tasted like strawberry daiquiris without the rum. I don’t think I’d order them again. Despite how good the food was, there are a few minuses to Jasmine. First, the menu doesn’t include some Thai favorites like pra ram chicken and massaman beef. Second, they don’t serve alcohol – not even beers to wash down the spice. Finally, the service could have been more attentive. We were done for a while before anyone noticed we needed the bill. The dinner for three came to close to $60 after tax and tip. Mike and I were in Los Angeles for the Democratic Convention last March, and decided to give Mo-Chica a try for lunch. We both like Peruvian food and were excited to see what this restaurant could do. With the right expectations, I think Mo-Chica would have been a great experience. Alas, our expectations were to quench our hunger without having to mortgage our home, and that is not quite possible here. Still, the food was very nicely presented and interesting and I appreciated the experience. Mike and I started with the tiradito de seabass. The thin slices of cold seabass (maybe 8 or so) came beautifully presented in a long plate decorated with the aji amarillo sauce. You would never have guessed from the delicate look of the dish just how bursting in flavor it’d be. It did get boring after a while, so this is definitely a dish to share. And it’s all about the flavor, there is almost no substance to the dish. As our main dishes, we ordered the carapulcra (“Peruvian sun dried potato stew, crispy pork belly, peanuts, chimichurri”, $14) and the Estofado de alpaca (“Braised alpaca, tagliatelle, aji amarillo sauce, fried organic egg”, $15). I’d had llama in Argentina, but I figured alpaca wasn’t exactly the same, so I might as well add it to my list of meats I’ve tried. I can do that now, but as the alpaca meat was cut into extremely small pieces, and its flavor was covered by the rest of the stew, I can’t quite say I know what it tastes like. I can imagine, that’s probably the point. There must be a reason why llamas and alpacas are pretty much only served in restaurants catering to tourists in their home regions. In any case, both dishes were very good, they had distinct and pleasant flavors and I enjoyed them. Neither, however, was a show stopper. The presentation and novelty, rather than the taste, is what justified their absurd prices for lunch. They also weren’t particularly generous portions. Mike, in particular, who had been less enthusiastic about the food and had let me had the lion’s share, left hungry. The restaurant itself looks too casual to justify its prices. It’s more of a hipster place, and I would perhaps not have minded it so much for dinner, where a larger meal at a larger expense might seem justified. Needless to say I won’t be going back, but I’m glad I tried it. Indian Oven opened up in the space that Raaga used to occupy. They still have the same phone number, but the space has been modified (part of the dining room is gone) and I think they are under new ownership. I went to the restaurant for dinner there last week with my sister Kathy, who was having a hankering for Indian food, and left mostly satisfied. Looks wise, Indian Oven doesn’t have much to recommend it for. It’s your typical Indian restaurant, without much in the way of ambiance, but nice enough. You go here for the food, not anything else. The service was quite good, however, and the waiters very young and very affable. Kathy and I were planning on taking food back home for Mike and Mika, who were at the pool, so we ordered tons of things. We started with the chicken pakora ($4), which was disappointing. The very small chicken pieces has been overly battered and were quite flavorless. To add insult to injury, they were very tough and dry. I got the impression they had been cooked earlier in old, almost stale oil, and then reheated. I would definitely not order this dish again. Indeed, you may want to avoid all chicken dishes at Indian Oven. Our chicken tikka masala ($10) was equally disappointing. The chicken once again was very, very dry. While I suspect that chicken tikka masala was invented in the first place to use up left over chicken tikka, most restaurants manage to make it with pieces that retain some moisture and flavor. The sauce itself was quite good, a pretty standard masala, and I’d order the dish again, albeit with lamb. Indeed, both of the lamb dishes we ordered were quite good. Lamb korma ($11) is one of my all time favorite dishes and Indian Oven’s version was pretty good. The lamb was moist and not overly fatty, and the curry was mild but flavorful. Kathy was disappointed by the lack of coconut flavor in the curry (per the description of the dish), but IMHO kormas never taste much of coconut. In all, I was satisfied though I’ve tasted better kormas elsewhere. The mint lamb ($11) was equally satisfying. 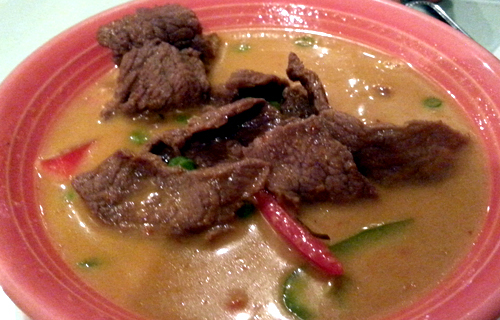 Once again the lamb was tender, and the mild mint flavor of the curry was quite alluring. Kathy enjoyed it as well. Finally, we shared a kashmiri (aka kabuli) naan ($4). It was good enough, though once again not the best version of kashmiri/kabuli naan I’ve ever had. It was s bit expensive for the quality. In all, our meal was quite good. What we ordered ended up being enough for 4 adults and one child, and the total bill came to $54 including tax and tip. I’d go back there again, though I might give other nearby Indian restaurants a try first. Daily 11 AM – 3 PM & 5 PM – 10 PM. Note: Raaga has closed. Indian Oven has opened in its location. I was visiting my parents in the SF Valley this weekend, and my sister Kathy suggested that we go to Thai West for lunch, a favorite restaurant in the neighborhood. Alas, it was close for Sunday lunch, so we went hunting for another alternative. Raaga was the first such alternative we found – and I was glad we did. We got to the small strip-mall restaurant around 12:30 PM on Sunday (July 2008). The place was deserted, and they were just putting out the lunch buffet. I hope people in the area are late lunchers, because no one came while we ate. The food was very good. The buffet consisted of three meat dishes (chicken curry, goat curry and tandoori chicken), and 2 or 3 veggie dishes – I noticed a vegetable sambaal and some daal, I’m not sure if they had something else. There was also rice, vegetable pakoras, raita and things of the sort. They brought fresh nan to the table, and it was very good, thick and warm. I loved everything I had. The tandoori chicken lacked the red dye that is usually used to give the dish its distinctive color, but it was juicy and very flavorful, without being spicy. Indeed, Mika, my picky 6-yo, ate quite a bit of it. The chicken curry was both rich and deep, a tiny bit spicy and somewhat sweet, with layers of complexity. It was not the sort of dish you tend to get in a buffet – I really enjoyed it. The goat curry was almost as good, well balanced, rich in flavor, giving you something new, yet familiar (to eaters of Indian food). Kathy tried the veggie pakoras and she thought they were very good as well, Mika even ate a couple of bites without complain. Service was great, if silent. The bill came up to $38 after tax. They only charged us for 3 buffets (there were 3 adults and 3 kids, but the kids mostly ate rice), and we had 4 drinks. In all, I thought it was very affordable for the quality of food.